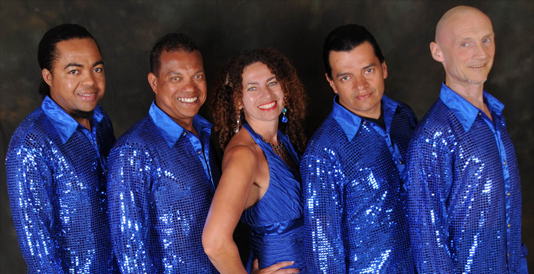 Coco Xpress - a 4-5 piece authentic hot Latin band with a generous helping of spice! With Salsa, Merengue, Lambada, Cumbia and more, representing all the popular Latino rhythms and countries, from Cuba to Colombia via Santo Domingo, this band will guarantee an excellent night's entertainment, for top dancers and left-footed tropical party-goers alike. "Coco" means coconut in Spanish, and the band is guaranteed to bring you all the flavour and heat of Latin America and the Caribbean. Coco Xpress features Latino singer Guillermo with not only a rich voice but also an entertaining manner and some hilarious routines. Also in the front line is female alto sax/flute player Nina: not only a strong musician but also a smooth dancer; to make the band as easy on the eyes as on the ears! The line-up is rounded off with Rivera swinging on bass guitar, Dominican Wilson 'El Diablo' - a maniacal devil at the piano, and finally Haime on conga drums- a talented group of musicians who know that on-stage presentation and lively performance is every bit as important as talented musicianship. Coco Xpress is equally suitable for parties, weddings and corporate events as it is for full-on Salsa dance nights, and bring a repertoire of songs suitable for whichever occasion. They can also provide professional dancers or displays, dance classes, DJs and other ideas to make the evening swing. They are a based in London but will travel anywhere, have been the house Latin band at the Dover Street wine bar for the last 18 months and recently completed a 3 week engagement at a 'Holiday Inn' nightclub in the Middle East.